The Lamborghini Aventador S Coupe is set to be launched in India on March 3, 2017 in Mumbai at a price upwards of Rs 5 crore, ex-showroom. 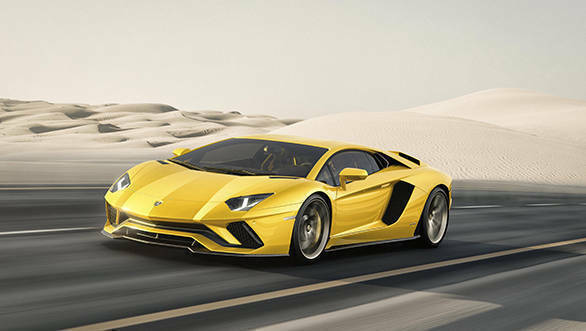 The Aventador S will get the same naturally aspirated V12 engine with a 7-speed gearbox from the standard Aventador Coupe, but will produce 740PS of power at 8,400rpm. That is 40PS more than before. Torque however, remains the same at 690Nm, which is produced at 5,500rpm. Apart from the active suspension, the Lamborghini Aventador S will also feature a four-wheel steering system which, as the name suggests, turns the rear wheels along with the front wheels, while entering a corner. The car will also feature a new driving mode called Ego. This mode allows the driver to individually adjust drivetrain and suspension settings. There are a couple of noticeable visual updates on the Lamborghini Aventador S too. At the front, the car gets a new bumper, while the side gets new air vents over the engine, which are supposed to reduce turbulence and improve cooling and efficiency. According to Lamborghini, the new design elements improve front downforce by 130 per cent. The Aventador S also features a fresh set of 20-inch and 21-inch wheels at the front and rear. The biggest change to the interior meanwhile, is the new TFT LCD digital instrument cluster.